Os grid reference: SD 2800 0671. At the western side of the town of Formby, Merseyside, close to the seashore and just along St Luke’s Church Road, stands the parish church of St Luke and, almost hidden in the churchyard (west side) is The God Stone, a small oval-shaped stone that is inscribed with a thin cross standing upon some steps. It is also known as The Corpse Stone or The Cross Stone. The present 19th century church stands on a pagan site, but probably from about the early 10th century it was settled by Vikings from Ireland or perhaps the Isle of Man; the stone being placed there at that time, or maybe earlier? Also of interest in the churchyard is the wooden cross, and in the church porch the 15th century gravestone of a local giant! The seaside town of Southport is 6 miles to the north on the A565 while Crosby is 5 miles south on the same road. Liverpool city centre is 10 miles to the south. The God Stone stands at the west-side of the churchyard beneath some trees. It is 1 foot 6 inches high and is oval in shape, but below ground it becomes a short stumpy shaft which tapers away. It was apparently moved to its present position in 1879. In the early 10th century Formby (Fornebei) was a Viking settlement and a pagan one, but by about 960 the site was Christianised and, later in the 12th century a chapel was established, which would become St Luke’s. There were at least two churches on this site previous to the present-day church, which was built in 1855. It would, therefore, seem that the God Stone became a sort of marker or “rebus” to which the newly converted could ‘congregate around’ and be baptised “at” by Christian missionaries. At some stage, maybe a few centuries later, a Calvary cross was carved onto the stone by missionaries (as a representation of Christ). 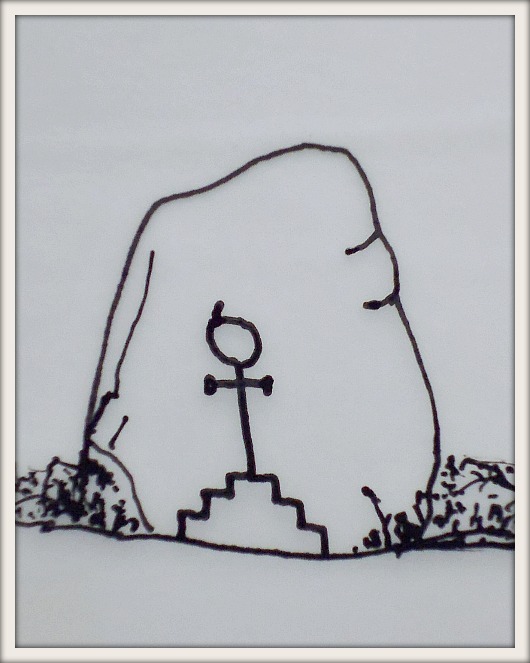 The curious little stone with its steps below a thin incised cross which has a circle or orb at the top (perhaps a Norse runic symbol) that ‘might’ signify commitment to Christ and ‘the climb up the steps to the cross’, and the nearness to heaven and then ‘eternal life’ (the afterlife). In the Middle Ages and more recent times, and also to some extent in pre-Christian times, corpses were ceremononially carried around the stone three times, or maybe more in order to contain the spirit of the departed and prevent it from coming back to haunt the relatives, according to Kathleen Eyre in her book ‘Lancashire Legends’. She goes on to say that: “The practise of carrying the corpse three times around the churchyard was witnessed by an English traveller to Holland a few years ago”. Though the author does not say who that traveller was! Also in the churchyard there used to be an old wooden cross of uncertain age (encased in zinc) and standing upon tiered stone steps (there is now a more modern wooden cross in its place), and also the 18th century village stocks. In the church porch there is the cracked 15th century gravestone of a local giant. Actually he was none other than Richard Formby, a local man and one of the ancient family of Formby’s, who was the armour-bearer of King Henry IV (1399-1413) and who died in 1407. His tombstone was brought to St Luke’s from York Minster where it received its crack when a wooden beam fell onto it during a fire at the minster in 1829. Apparently Richard was seven feet tall. An inscription on the gravestone reads: “Here lies Richard Formby formerly armour-bearer of our Lord and King, who died on the 22nd Day of the month of September in the year of our Lord 1407. Upon whose soul may God have mercy”- Kathleen Eyre ‘Lancashire Legends’. Housed inside the church is a crude 12th century font which came from the first building on this site. Eyre, Kathleen., Lancashire Legends, The Dalesman Publishing Company Ltd., Clapham, North Yorks, 1979. Categories: Inscribed Stones, Marker Stones, Misc Subjects | Tags: The God Stone in St Luke's Churchyard at Formby in Merseyside | Permalink.